As software development has moved to Continuous Integration, Continuous Delivery, and DevOps, releases have accelerated—but at the expense of visibility. Using best-of-breed tools provides flexibility, but often sacrifices your integrated view into the process as a whole. Analytics brings visibility back by surfacing issues into your release process, allowing you to make informed decisions to optimize development costs and improve business outcomes. 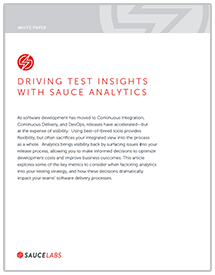 Download the white paper and learn some of the key metrics to consider when factoring analytics into your testing strategy, and how these decisions dramatically impact your teams’ software delivery processes.